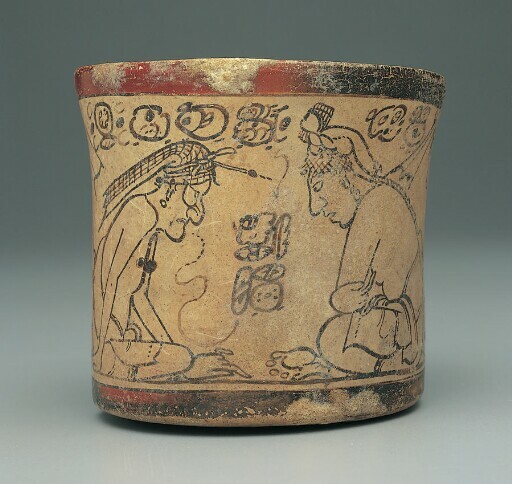 This celebrated vessel depicts two scenes with the Itzam, an elderly deity associated with creation and atlantean roles, in animated lessons with four young pupils. The Itzam is recognizable by his aged features and his netted headdress with a brush wedged into the ties. In one scene, the Itzam is holding a pointer and reading from a folded codex placed in front of him. As he looks directly at the two individuals seated in rapt attention in front of him, he recites the bar and dot numbers attached to a speech thread, which may represent an arithmetical or calendrical calculation. In the second scene, the Itzam hunches intently forward and taps the ground as he speaks to two similarly attentive pupils, one a royal youth (ch'ok) wearing a turban, and a second figure with a goatee. The Itzam’s spoken words appear as a group of glyphs connected to a speech thread that emanates from his mouth. The Codex style take sits name from a small group of vessels painted with scenes of great realism in very fine monochromatic lines on cream backgrounds by artist who must have been primarily painters of codices, the folding-screen books that the Maya made from bark paper covered with stucco. These codex-style ceramics give an excellent idea of the high elegance and extraordinary delicacy that must have characterized ancient Maya books, none of which have survived from the Classic period. purchased by Kimbell Art Foundation, Fort Worth, 2004.